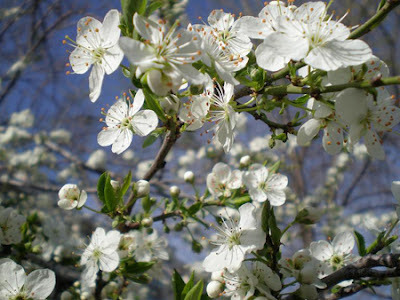 Nowruz - the spring New Year festival in Uzbekistan - is approaching. Suzanna Fatyan, one of Uzbekistan's finest tour guides, shares tales of the Nowruz table in her home town, Samarkand. Uzbekistan is the country where people love gathering for different events and festivals. The favourite, and most traditional feast in our country is Nowruz. Celebrated on 21 March, it is the holiday of New Year and the spring equinox. For more than 3000 years Nowruz (also known as Navruz in English) has been celebrated not only in Uzbekistan, but also throughout Central Asia, Iran and the Middle East. For everyone the holiday is associated with the beginning of a new life, the revival of nature and the creation of closer ties with relatives, neighbours and friends. Nowruz is a holiday of kindness, forgiveness, joy and warmth. The roots of Nowruz date back to the times when most inhabitants of Central Asia and Iran were sun worshippers. Later the holiday was adopted by followers of Zoroastrianism, the earliest religion that developed a theory of dualism: it divided the world into good and bad. It called for good thought, good word and good deed. Zoroastrianism is the religion connected to nature and reveres the main four elements of fire, water, air and land. Being a part of nature, Zoroastrian customs and festivities did not disappear after the Arabian conquest of Central Asia. Instead they were integrated with Muslim traditions. They absorbed the new culture and gave birth to the amazing and colourful Nowruz. The philosophy of Zoroaster later appeared in Eastern and Western cultures. There are many similarities in the Greek and Zoroastrian pantheon: the fertility goddess Anahita is named as Anaïtis in Greek. Later, Nietzsche in his Thus Said Zarathustra uses the plot of the Zoroastrian prophet to appeal to humanity with his ideas. There are certain preparations necessary for this New Year celebration. Before Nowruz every person must clean every part of their house and forget all offences. In the old times Nowruz was celebrated not only on March 21 but also on June 25: ancient Sogdians had a custom to swim in the waters of the Siyob river to purify their souls and hearts. Today this custom no longer exists: after the reforms in Persia centuries ago it was decided to celebrate Nowruz only on 21 March, when the Sun enters Aries. In some regions during Nowruz there is the Chaharshamba Suri tradition – a torchlight procession. It symbolizes the burning of everything negative: diseases, misfortunes, sorrows. In Samarkand Chaharshamba Suri is typical for weddings today. Every country has its own rules for celebrating Nowruz. Somewhere it’s a must to prepare seven items starting with the letter S (in the Persian language) for the New Year table. Somewhere else the main meal should contain seven elements. In Uzbekistan these rules also vary from one city to another. I would like to describe the Nowruz celebration in my native city – Samarkand. In my mahallah (neighbourhood), I can not only celebrate Nowruz but also participate in preparing traditional dishes for this event. I can make wishes mixing sumalak in a huge pot in my neighbour’s garden, exchange gifts, and enjoy the atmosphere of universal joy. I want to introduce you to a famous Samarkand cook Mubaro Sharipovna, whom I visited to learn more about the Nowruz table. For many years the kitchen of this remarkable lady (and physics teacher!) has attracted visitors from around the world. From the early 1990s she started receiving guests from Iran and Europe for traditional lunches and dinners. 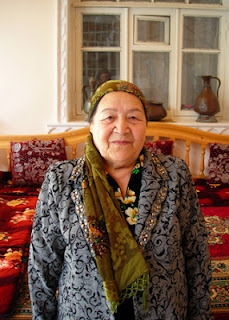 She offers Uzbek hospitality and shares the warmth of her family with everyone. (If you book in advance, you can dine at Mubaro's at Shahsina National House, 16 Turon St., Samarkand, tel: 998 66 237 4621 or mobile +998 66 226 6158). At Nowruz, Mubaro Sharipovna holds special festivities, inviting her entire mahallah and all her friends. And of course she makes sumalak and halisa –“must tastes” for every visitor to Uzbekistan during the festival. Sumalak is a dish that requires a lot of skill and preliminary preparations. Mubaro's family buys 20-30 kilos of wheat and germinates it in advance. Germinating wheat needs not only experience but also lots of patience! Every morning before it reaches 2.5 centimetres, the wheat needs to be washed and spread out on a flat, raised surface and covered with gauze. This work is usually done by women and accompanied with prayers. After the wheat is germinated, it must be ground and washed; after the third washing the wheat is ready for cooking. For that purpose the family has a huge pot, like those we use for wedding plov. At the bottom of the pot, the cook allocates 20 clean stones and walnuts to avoid clumps. Later the stones will be removed, though only after the dish is ready. Before that it boils for at least 12 hours and attracts all the neighbors for making wishes. Sumalak is usually cooked at night and it makes the holiday even more charming and mysterious. Everyone enjoys folk songs and rousing dances while the sumulak is cooking. After the sumalak is ready it needs to sleep, covered, and hidden from everybody’s eyes for at least two hours. Then, around 9 o’clock in the morning, it wakes up and, accompanied with songs, visits neighbours, relatives, and friends together with lavz halvoi (halva) and other treats. It is interesting to note that in some regions it can be also accompanied with decorated eggs like the Christian Easter tradition. Now, that the sumalak has visited everyone, it will enrich all those who eat it with energy, health and fortune. Enough for the whole year! Important warning: if you decide to cook sumalak yourself, use only mulberry tree or cherry tree wood. Only these trees are considered suitable for this sacred ceremony. 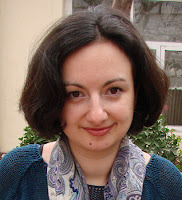 Halisa is another 'must do' for Nowruz. In Tashkent this specialty is known as halim. This wonderful dish is perfect for meat eaters. Its proportions are 1:3. You don’t understand what I mean? 10 kilograms of wheat to 30 kilograms of meat completely separated from the bones! Like sumalak, halisa is cooked in a huge pot for 12 hours, which makes its taste very special. 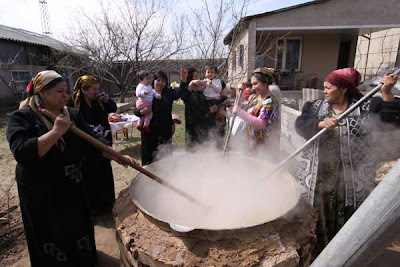 If you have ever visited Armenia, halisa might remind you of kurkut, a traditional Armenian porridge. As you travel around Uzbekistan, remember that in Tashkent halisa (halim) is served with sugar, which never happens in Samarkand: the Samarkand version of the dish can be accompanied with chakka (a local yoghurt). 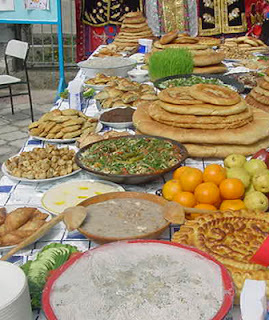 The Nowruz table is very rich and not limited to sumalak and halisa, although these are substantial and seem enough to feed several mahallas in the city. Families also cook samsa, barak beirok (a kind of fried ravioli), pirojki filled with potatoes and the most important bichak – savoury pastries filled with green vegetables. It is very symbolic: in spring nature wakes, trees start blooming and fresh greens seduce us with their wonderful aroma at Siyob Bozori, Samarkand’s fruit and vegetable market. Do you think my list of Nowruz dishes is over? No, you are mistaken. Shurpa and plov also must be prepared for the feast. And not a simple plov, but tugrama palov – festive plov, with raisins, chickpeas, excellent meat, and quail eggs. Finally time for dessert: shordonak (salted apricot stones), parvarda (traditional type of candy), lavz halvoi, halvoi ruhonim, raisins, dried apricots and of course green tea. Everything you need for happiness you find at Nowruz table! Remember, celebrations are not limited to 21 March: they take place for a month. So, for a month, be ready to receive and visit friends, exchange gifts and yummy treats, and enjoy life. Happy Nowruz!